Ev-e-ry time plot #92 gets close to being workable it s*dding rains. 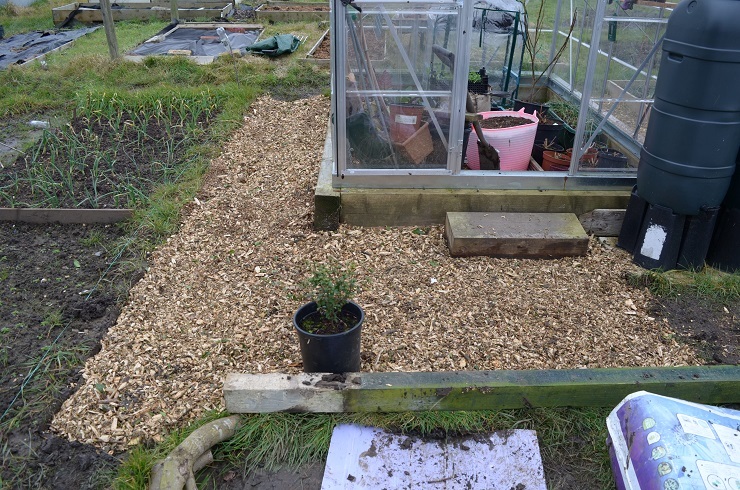 The front of the greenhouse was a lake, despite the new bit of path along the side doing a fine job of soaking up some water. Even I know sitting in water isn’t good for the beams the greenhouse is resting on. Until I figure out how to minimise that, a bit of bodging is in order. 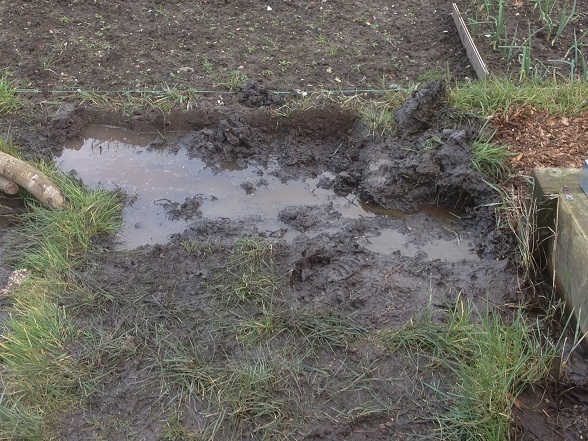 I attempted to dig out turves, spattering myself with mud in the process, so that the water would drain from the greenhouse*. It did work, but the little path to Sod Mountain is essentially slurry, which means the barrow refuses to travel with heavy turves in. So I flung them. I’m not the fittest and I know I will pay for it tomorrow! My neighours’ cardboard boxes are being put to good use lining the paths to keep rampant couch grass at bay. Several barrows of steaming woodchip later another section of path is finished. I think it looks pretty smart. 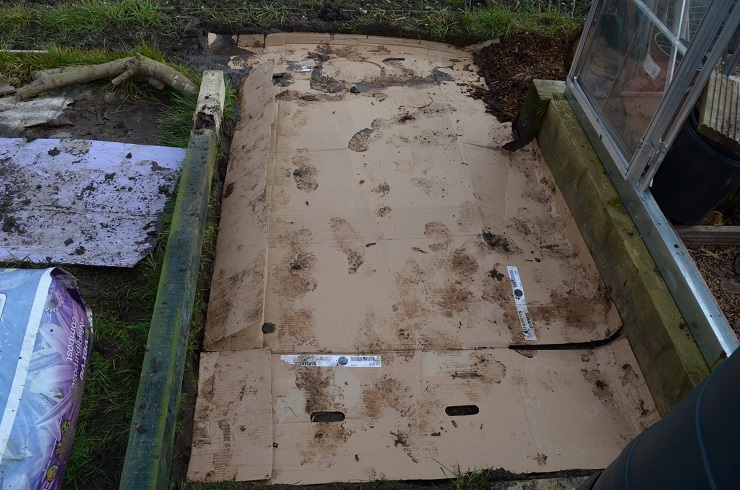 More importantly, I can get to the greenhouse with dry feet & no fear of becoming a mud angel. The extra-wide bit will be brilliant as a seating area/chilli nursery. In the sunshine the view across the field is glorious. You can only clearly see the chapel in the cemetery next door at this time of year, while the trees are still bare. 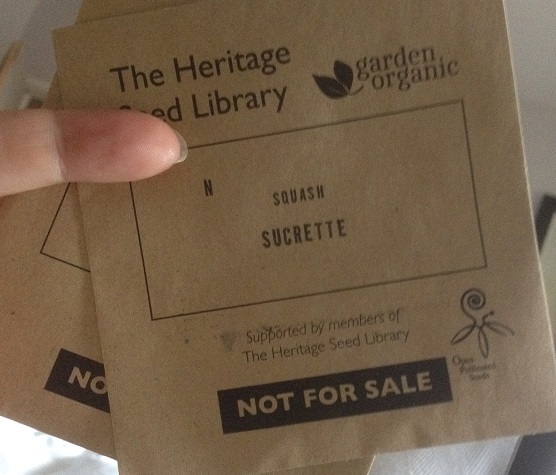 At home this year’s HSL Orphans List seeds have arrived – Sucrette squash, to go with the Black Coco beans I kept back from last year’s crop. I asked if I could save something other than peas, beans or tomatoes. Not that I have anything against them, or think they are less worth saving, but I have No Space left for tall plants. Stuff that rambles underneath, now that I can accommodate! I am planning on running them under and around the fruit bushes, whether they end up on #92 or #100. And let’s face it, till it’s drier that’s not a pressing question! What is already becoming pressing is seedling space. I don’t want to go on and on about the constraints of London living but…small flat. Himself has bought a venus fly trap and a large frame filled with a gorgeous picture of Small Child. So far all lovely. 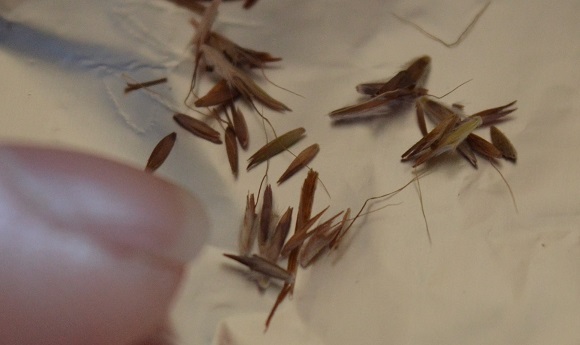 But he’s put them on the windowsill in our spare room – traditionally emergency seedling overspill space. I see cake-based bribery in my future. 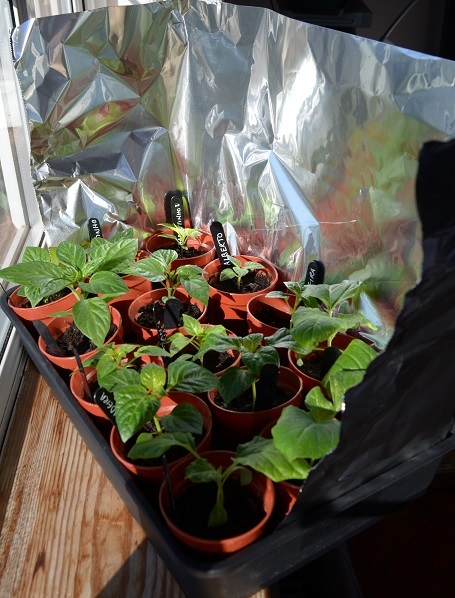 I’ve had to graduate 15 chillies from under the growlamps to fit in another 24 smaller ones. 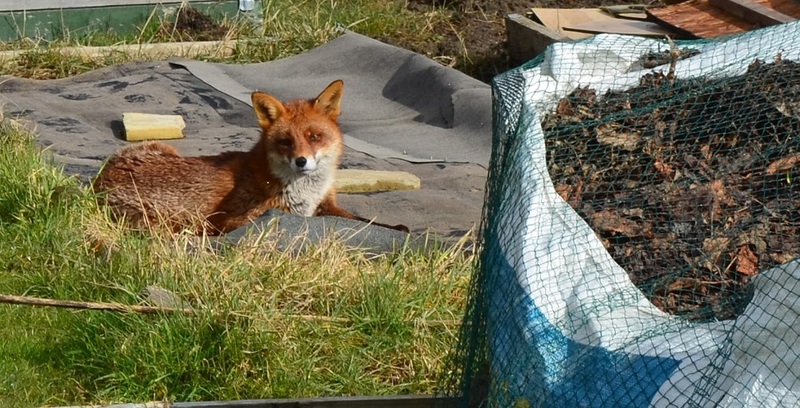 The lucky 15 are basking in the sun with a tinfoil collar. I have a LOT of chillies this year. Some of the spares are going to my plot partner and the others are off to a new life in Croydon. SaffronCentral is branching out into new crops this year, including plans for a whole lane of chillies. The propagator is full again. And March has hardly begun. As soon as the latest sowings are up I can make a start on tomatoes and praying for warmer weather! 4 th March sowings: Lemongrass (East Indian) see pic right – teeny tiny seeds!, capers, replacement Ailsa Craig & Rijnsburger onions, yellow Cayenne chilli, pre-soaked Pinocchio’s Nose & Passilla Bajio chilli (last chance! ), cosmos (Sweet 16, Double Snow Puff, Antiquity), coreopsis, many more marigolds to replace the frosted ones, sweet sultan, larkspur. And pompom asters. Given these flower endeavours I hope the bees stop by often this year! Cheers Alan – got a fair bit more to do but it’s a good start.